Mountain Sky Micro-Greens – Give Us the Numbers! OK, what about the MONEY? The Cash! Mula! Mucho Dinero! So here’s the skinny. This is as good as or better than some of our friends say the funny weed money is. Yep, that’s what I hear. So here goes. Here in Northern Colorado, we are paying anywhere from $300/ton or $0.15/lb. to $500/ton or $0.25/lb. for grass or grass/alfalfa mix hay. Everyone thinks it will be going to $600/ton ($0.30/lb.) by the end of 2012. The most important variable in the costs above it the multiplier of harvest weight versus the planting weight. For every pound of seed planted our goal is to produce 5 lb. of grass. When that multiplier moves up or down, it greatly affects the cost of production. But here is the cool thing, we have been getting consistent harvests with multipliers greater than 6.0 and a number of days have been over 7.0. We have even had several days with multipliers over 8.0. We firmly believe that as we refine our production process we will be able to achieve that 7.0 multiplier consistently. So what would you rather spend, $0.25/lb. for inconsistent quality, dry, spindly hay or $0.06-$0.11/lb. 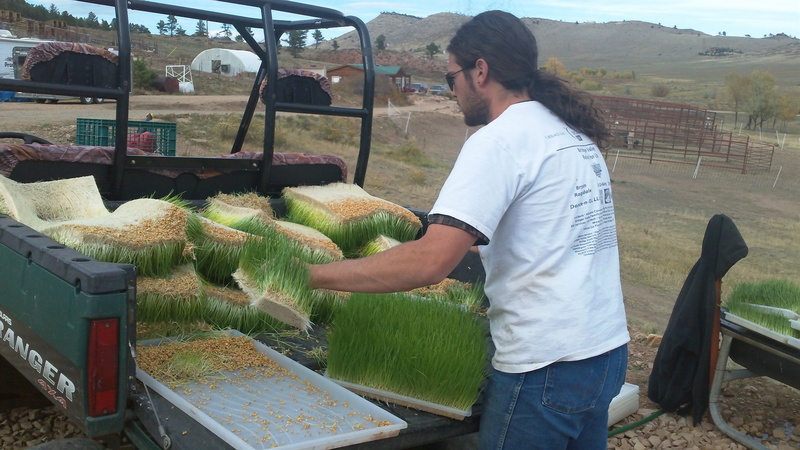 for green, nutritious, easy to feed wheat or barley micro-greens (fodder). Oh, I almost forgot, that hay probably uses over 5 gal. of water/lb. of production and the micro-greens will take less than 1 gal./lb. of water with most of that being taken up by the grass. This is an 80% water savings! Water in the west is gold, and when you can produce livestock feed with this little water you are being as sustainable as you can be. In no way are we there yet in our micro-green production. We have much to learn and more money and water to save. But, we have learned a lot and with almost a year of full-time research under our belts we are ready to provide our knowledge to the the livestock world. We are looking for both financial and operating partners for our Donoma Si livestock feed program. We are offering licensing opportunities, consulting services and custom construction services. For as little as $349 you can participate in our Sustainable Livestock Education Program. Contact us today to discuss how you could partner with us in this opportunity. What do you provide in your education program? 1.i am from India, i have enough land to produce such cattle feeding grass. hv u got any plan for me.please suggest me. 3. is there enough demand exist in other countries for such product to feeding cattle like, cow , pig , goat etc. Thank you for contacting us! Please get in touch with our office and we’d be happy to discuss your options. Would like to arrange a call to discuss your hydroponic micro-green growing system. Thanks for your interest in hydroponic system. I will inform my team and someone will get in touch with you soon. You may also use the link provided here to schedule a call with us. Looking forward to getting in touch with you soon. This is Info You Do Not Want To Miss!! Please enter your details below for more information! Are Your Livestock Ready For Summer? The information provided here provides no guarantees or assurances. Financial projections are for information purposes only.